With the growing trends in theme-based wedding, the number of wedding planning companies is on a rapid surge. If you’re a wedding planner and wish to establish one such company, the first step you should take is to name your company carefully. You can attract clients and establish your new business as a brand if the name is perfect. Wedding planners are many in any given city or market. Dozens of new and established planners have advertised their business. The market is highly competitive, and any new entrant faces a hard competition. The only way to move up and grow is to make unique marketing strategies. Naming your new business is the first such strategic move. A perfect business name for your wedding planning company is essential. It is your unique way to drive the attention of people and your target clients toward your small venture. You can tell your business story to the audience with the right name. It also helps you convey your niche services to your target clients. But naming is a creative process. You may take a few days and several sessions of meeting with your team members and friends before you pick the right name. 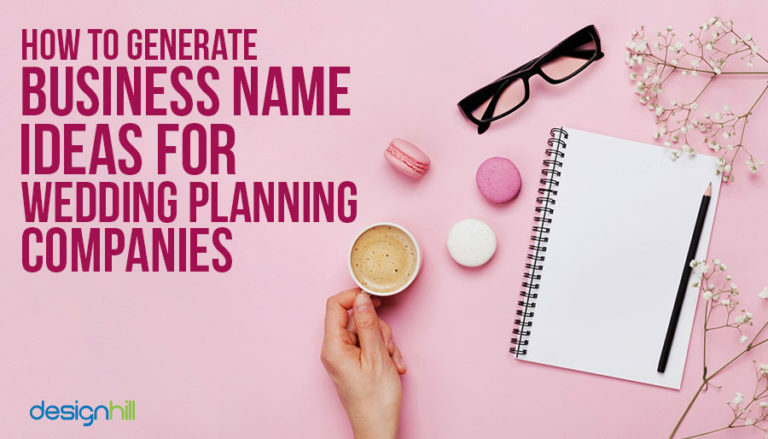 However, you should consider some vital aspects of your wedding planning business in naming your company. The present-day businesses give utmost importance to the art of naming a business to drive audience. Are you thinking of starting a wedding planning company? If so, then here are some business name ideas you can consider for your new business. Before you set out to name your wedding planning business, know your target market and audience. Are you targeting affluent people who look for a lavishing wedding ceremony and celebrations? Or, are middle-class clients your target? The name you pick should then reflect the section of the population. So, make sure that your wedding business name conveys the expectations of your audience from a wedding & event planning company. Looking for a wedding logo design? Many other wedding planning companies are already active in your city. People already are familiar with those names. If your company name also sounds more or less the same, they may not find your wedding services distinctive. They will get the impression that your new venture does not cater to their specific needs. But with a unique name, you can send the right signals that you enter the market with something new to offer. Therefore, research your competitors’ business names. Once you have all those names, the goal should be to get a name idea that looks entirely different. Such a name will most probably appear on your wedding event planning logos that people will see in your advertisements and marketing campaigns. While the name you pick should please you, it is equally important that your potential clients also like the name. After all, you will be working with them. Any name that repels them should be avoided. For example, if you are targeting a high-end wedding client and your company name is something funny, it may not go well with those sophisticated customers. You should, therefore, test the name with people from your target audience and see how they react. Do not forget that the name will also appear on your wedding logos, which people will see everywhere. So, pick the name carefully. How about naming your company after your name? If you are an artist or performer, then think of using your name as your identity. You can use your first or last name. Often, this helps in picking a unique name. This approach works well when people refer you by your name. When your name is created in your wedding logo design, people will like it even more due to the visual impact of the logo. Make sure that your company name is memorable so that people can keep it in their mind for a long time. People usually like a catchy name. But when thinking of such a name, think of the type of audience you are addressing. You should avoid using generic words such as ‘Unique Events’, Unique Photography, Elegant Events, or Sounds Entertainments. Instead, experiment with some alliteration, rhyme, and rhythm to create catchy words. Such creative name ideas will help your designer to come out with unique wedding logo ideas. A combined impact of a catchy name and the logo will help you drive potential customers. You should prefer a name that is short and simple. With such a name, you can hope that people will remember it easily. Anyone can easily pronounce a short name easily and Google it to search the web for your company. This is why most global business names are simple. Such names come to mind immediately when people look for a product or service. Moreover, your logo designer will love such a wedding company name as it may help in generating some unique design ideas. When people think of a company name, they make some perception about its business. As the company grows, the perception helps build a brand identity of the company. Here, your wedding planning company name will play a key role in deciding what the audience thinks of your services. You can also take help from several sites that are dedicated to generating business name ideas. Type a keyword related to your wedding planning company in the search box of these sites. You will get a long list of the related business names. If you are looking for some unusual and quirky names, then these are ideal sites to explore. However, these sites are not an alternative to brainstorming sessions that you conduct with your friends and company members. In fact, you should use the software to get name ideas and then discuss them while brainstorming. The software can be used to get some unique naming ideas. You can then compare those names to find out which ones of them will look better in your company logo. If you can explore these sites, make sure that you pick a perfect company name for your wedding business before looking for a professional graphic designer to create a wide range of marketing materials such as brochures. Your wedding company name will also work as your trademark along with your logo. If you do not register the name with your state authority, the chances are that someone may misuse it or adopt the name for a business. In that case, you cannot take legal action against the infringement. Therefore, register the name you selected with the trademark registration authority of your state. But pick the company name that is others have not already registered. So, go to your state’s website to check if the name is available for trademark registration. In this way, you can find out which names in your shortlist are available for the registration. Take this step before you hire graphic design services to create a host of designs such as logos and brochures. A domain address is crucial to doing business through the web. Your clients will search the web for your wedding planning services. So, when they type some keywords to locate the services, your website should appear in the search results. But that will happen only if you have the website, which requires you first to have a domain address or URL. Therefore, the name you selected for your company should be available as your domain address as well. This means that if you want to have some unique graphic design ideas for your website, the domain address is essential to have first. A majority of your potential clients are on a social channel such as Facebook and Twitter. Your wedding planning expertise can reach to millions of people through social media. So, having a username for your social media page design is the basic requirement to engage your customers with your business. You should, therefore, check if your wedding planning company name is available as the username for different social media. These are the basic points you should take into account when naming your wedding planning company. The entire naming process may take some days and several brainstorming sessions. After you have finally chosen a perfect name for your wedding planning company, you need to create a convincing visual identity of your business to market it effectively. Designhill, a leading marketplace to create wide-ranging designs such as logos, brochures, website, and others can help you with dozens of new design solutions at affordable price. Your wedding planning company should have a simple but unique name that people can remember to recall your business. But you need to sit through some brainstorming sessions to get the right name. After all, your company name is your identity, and it targets your customers.